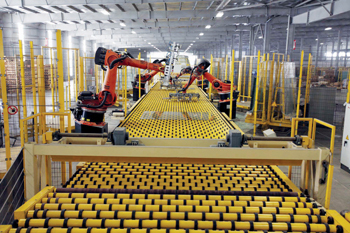 Established in 2009, Emirates Float Glass is the first state-of-the-art integrated float glass facility in the UAE, located on a 320,000-sq-m plot at the Abu Dhabi Industrial City. The company supplies regional and international glass processors with premium quality float glass products used in the architectural and automotive industry segments. The products are exported to more than 65 countries spanning South America, Europe, Australia, Far East Asia and Africa, in addition to the GCC states, said the statement from Dubai Investments. The massive recognition for EFG, which is part of Glass LLC, reflects its commitment to adhering to occupational health and safety guidelines, it added. EFG general manager Ghassan Mashal received an award and a certificate for the milestone from Nabeel Saleh Al Awlaqi, HSE director at Industrial Development Bureau, during a ceremony held at the EFG plant in Abu Dhabi. “This milestone is commendable considering the risks and hazards involved in the float glass manufacturing processes,” stated the top official. “EFG is thankful to Department of Economic Development (DED), IDB, Abu Dhabi Occupational Safety and Health Centre, ZonesCorp and other government authorities for their support in achieving this milestone,” he added. Earlier, the company received a Bureau of Indian Standards (BIS) certification. The new certificate represents a further accomplishment for EFG. EFG was granted the BIS Certification Mark Licence No CM/L-4100052260 as per ISO 14900:2000 for its 2mm to 13mm product range. The company recently showcased its cutting-edge technologies, capabilities and offerings recently at the 25th edition of Glasstec International Trade Fair and Conference in Dusseldorf, Germany. A global industry event held in the German city from October 23 to 26, Glasstec International Trade Fair brought together 1,200 exhibitors, and more than 40,000 visitors from over 100 countries worldwide. 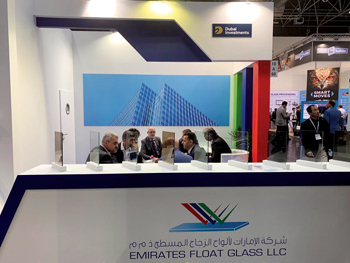 A number of Emirates Float Glass delegates attended the event, and manned a stall which informed visitors and prospective clients about the EFG offerings, from clear and tinted float glass through to its pyrolitic reflective glass range, and its state-of-the-art manufacturing facility. “Emirates Float Glass has been attending Glasstec since 2010, and as the leading trade fair in the industry, it is an important date on the calendar for all the key players and big names in the industry and beyond. As always, this year’s event is a great showcase for the industry and for the brands working within it,” he noted. The Glasstec trade fair and conference is a specialist event held every two years for the glass production and processing industry. This year’s event placed a special emphasis on thin glass, facades and smart glass, crafts and interior design and industry 4.0. “We are confident that many of the 40,000 visitors to the event will come away with a better sense of our world-class standards and practices and also our reach as we export to over 65 countries spanning South America, Europe, Australia, Asia, Africa and the region,” he added. Meanwhile, Emirates Insolaire LLC, a solar panel manufacturer and a joint venture between Dubai Investments PJSC and InsOglass SA, showcased its range of sustainable, energy-efficient coloured solar panel technology along with examples of its project work at the recently held World Future Energy Summit (WFES). The event, a global industry platform on energy, clean technology and sustainability, was held in Abu Dhabi from January 14 to 17. Emirates Insolaire produces and distributes coloured solar glass and coloured photovoltaic modules using Kromatix technology, a unique patented product which provides a complete solar solution that can be adapted into any façade or roof of a residential or commercial building, and integrated into any architectural design.